The first single ‘When I Was A Boy’ has a Beatles feel to the piano intro and the song again touches on Jeff Lynne’s love of radio and the music he heard on it as a kid (as his covers album ‘Long Wave’ did). Nice to hear the strings at the outro and a couple of times in the song and a song that grows on you after each play. Liking it! Not sure who is playing on the album with Jeff, hopefully Richard Tandy in some capacity. First album of all new ELO music in over a decade. 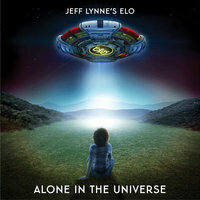 Jeff Lynne’s ELO release their new album, ‘Alone In The Universe’ on November 13th, 2015 on Columbia Records. The album is available globally for pre-order Friday, September 25th (buy links listed below) and the first single “When I Was a Boy” is also available Friday. Fans who preorder the album will receive “When I Was A Boy” instantly. This entry was posted on September 28, 2015 at 7:20 pm and is filed under AOR, Classic rock, ELO, Jeff Lynne, Melodic rock with tags classic rock, ELO, Jeff Lynne, melodic rock. You can follow any responses to this entry through the RSS 2.0 feed. You can leave a response, or trackback from your own site.